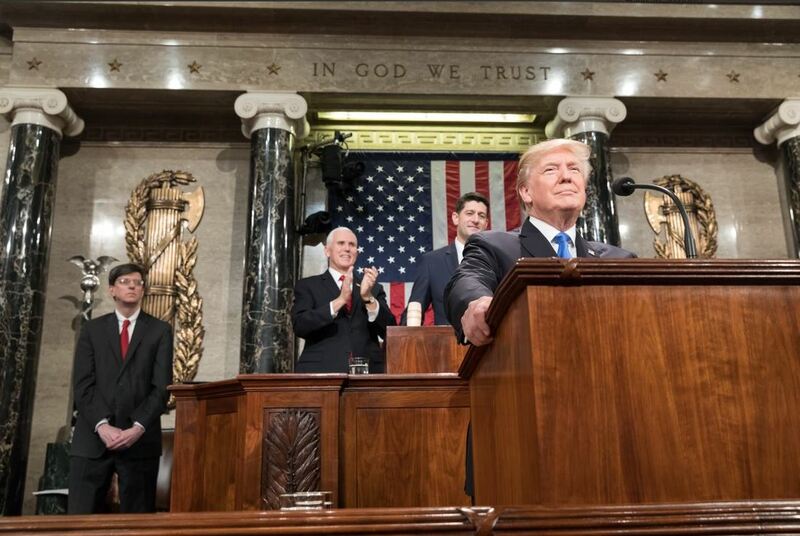 As expected, President Trump used his first State of the Union Address Tuesday night as an opportunity to discuss infrastructure. The speech was light on specifics, though the Washington Post and other outlets continue to report that the White House is preparing a full plan to be released in a few weeks. Smart Growth America’s President and CEO Geoff Anderson released a statement after the State of the Union. LOCUS, our national coalition of responsible real estate developers and investors, also issued a response. This blog post was originally published by Transportation for America, a program of Smart Growth America. In his address, the president urged Congress to “produce a bill that generates at least $1.5 trillion for the new infrastructure investment we need” and said “every federal dollar” should be leveraged by funds from local governments and the private sector. Other than these few remarks, there were few details offered in the speech itself. We agree with the president that it’s high time to repair and invest in our infrastructure. This goal cannot be achieved without presidential leadership, and we appreciate the president’s stated commitment to this issue, beginning as a candidate and continuing through today. We look forward to seeing the details of a plan and are ready to work with the administration and Congress to develop an infrastructure plan that 1) provides real funding, 2) fixes our existing infrastructure, 3) funds smart, new projects, and 4) measures success. Repairing the country’s roads, bridges, and transit systems while investing in new projects to strengthen the country’s global competitiveness does require a real commitment from the federal government. Gutting existing federal funds from other programs (such as transit, as Trump representatives have proposed) will undercut that effort during a time of mounting needs and increasing competition for waning federal funds. Only real funding will be able to fulfill the diverse infrastructure needs we have nationwide. Yet over the past year, this administration has repeatedly proposed cutting federal funding for transportation projects, while hoping that private capital or dramatically increased local funding can make up the yawning gap. Picking projects only from communities that can come to the federal government with a huge chunk of their own money, or those that have high tolls to repay financing costs, does nothing to guarantee that we’re selecting the best projects to deliver long-term economic growth. The needs of smaller, rural, and poorer communities in particular will go unmet in this scenario as these communities won’t be able to compete against larger cities. Further, a true effort to rebuild will ensure that repairing deficient bridges, deteriorating roads, and aging railways gets priority for funding. We cannot simply dole more money out to states in a big block and hope that they spend the money well—taxpayers deserve better. Any infrastructure plan should include clear goals and metrics for determining whether our investments are meeting our national goals. Finally, the president spoke of the need to speed up the permitting and approval process for transportation projects. There are indeed many ways we can and should improve the process for new projects to both save money and time. However, it is important to remember that the approval process is not a trivial review or bureaucratic exercise. It’s the process by which we protect private property rights and ensure that communities are not divided or harmed unnecessarily. We could certainly build projects much faster if we simply seized people’s property and laid highways over neighborhoods. China and Russia can build much faster by taking that approach, but it’s not the American way. Speed of project delivery is not more important than building cost-effective projects that build strong communities. To be successful, we urge the president to propose real funding targeted specifically to rebuild crumbling infrastructure in all communities across the country—large and small, rich or poor. We look forward to seeing such a proposal from the administration in the coming weeks. In the meantime, though written as a preview of the speech, this post highlighting eight key questions about the president’s plan is still a relevant guide to evaluating what you hear from Washington when it comes to infrastructure.